Matt Barnes, Andrew Hawkins, Snoop Dogg, Mario and Red Grant participate in the 5th annual Athletes vs Cancer Celebrity Flag Football Game on Aug. 12, 2018 in Los Angeles. Reggie Bush, Terrell Owens & Baron Davis took to the gridiron on Sunday to help raise money for the 5th annual Celebrity Flag Football Game and All-Star Weekend. 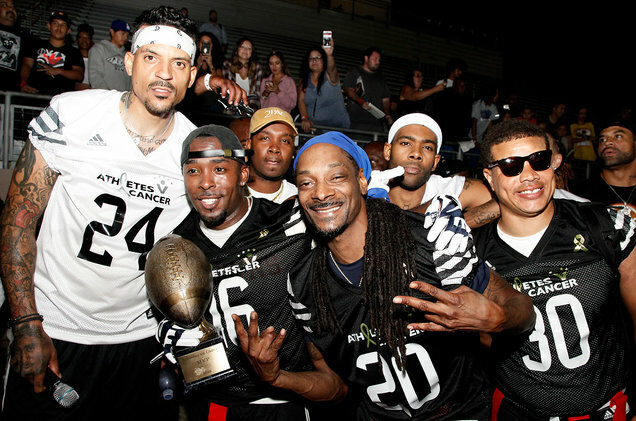 NBA Champion Matt Barnes and legendary rapper Snoop Dogg each led their teams in a spirited game that was half flag football and half block party with players jamming out to blaring tunes between plays. The event is hosted by Barnes annually as part of a weekend-long fundraiser for cancer research, that included a bowling tournament and a pool party. The game was only one aspect of what felt like a rambunctious end-of-summer party. There were giant bounce houses in the kids play zone and hungry fans and players could grab a bite at food trucks like Wise BBQ and the Grilled Cheese Truck. Hundreds of fans packed the stands for the game with Barnes’ team wearing white jerseys and Snoop leading his team in black. USC football legend REgBush still looks game ready even a year after his retirement from the NFL. He told THR why he felt it was important for him to participate in the game. “I think everybody here has been affected in some way, shape or form by cancer. Obviously, it's a nasty disease. It’s taken a lot of people way too soon. I’ve been affected by it, close family members, friends, co-workers and so I’ve known Matt and Snoop for a long time and they’ve supported me for a long time so its only right that I come to support them,” he said. The players also took time to interact with the fans during the game, with newly acquired Laker JaVale McGee being a popular selfie request and Snoop running up to the stands to sign autographs for dozens of eager fans. The game itself was competitive and fun as Team Snoop struck first and rode a tough defense to a 26 to eight halftime lead. However, Team Barnes came storming back in the second half by looking to Hall of Fame wide-out Terrell Owens, who snagged two second-half touchdowns, including one long bomb that tied the score as the game clock ran out. The friendly yet competitive game went to overtime and eventually, Team Snoop reclaimed the lead and took the win with a touchdown.